What if somewhere in your heart, you already knew what next steps to follow on your path? Imagine that your intuition would guide you through each major decision and you could mark each challenge and each victory as lessons. What if you could believe that everything would unfold exactly as it should? I truly believe that if you listen and observe your surroundings and are willing to surrender attempts to “make things happen”, you will be offered opportunities beyond your wildest dreams. It started way back when for me. When Neil and I split up in our late twenties, I missed him in every significant moment after that. I tried to move on, believing that you could create that kind of connection with anyone with enough effort. I really tried, knowing that I wanted to get married, have children and have a house, I moved on as best I could. I attempted a marriage and was blessed with the children that I was born to raise. They are sensitive, intuitive, compassionate, intelligent and extremely creative. I thought about Neil every day, wondering what he was doing and whether he had been able to move on. When my marriage was over, I googled him for the umpteenth time, and amazingly he popped up. Unbeknownst to me at the time, he had just been promoted and that’s why he was listed on his company’s website. At just the right moment, I reached out by letter. He held onto it a few weeks, recognizing my writing but knowing that once he opened it, his life would be changed forever. It was. We have celebrated our fifth wedding anniversary and about ten years of being back together. We’ve known each other for twenty four years this April. There have been so many big life moments, happy, challenging, heart-wrenching and raw that have challenged us but we both know that we are on this path together and it’s the right path for our family. Those opportunities and chances taken have benefited our children in too many ways to count. 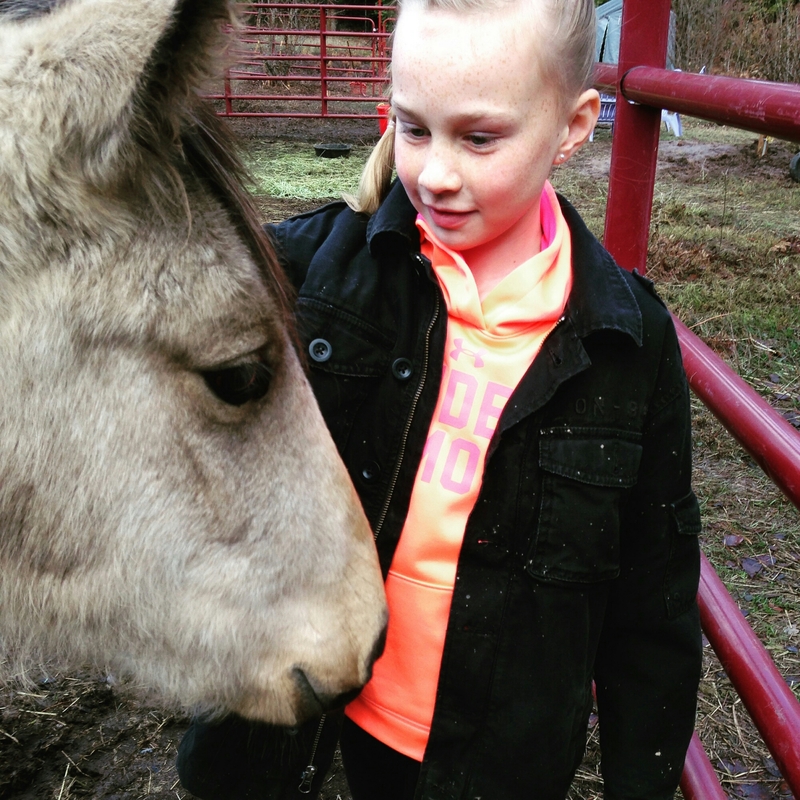 The country life with a small school is the exact right fit for them. 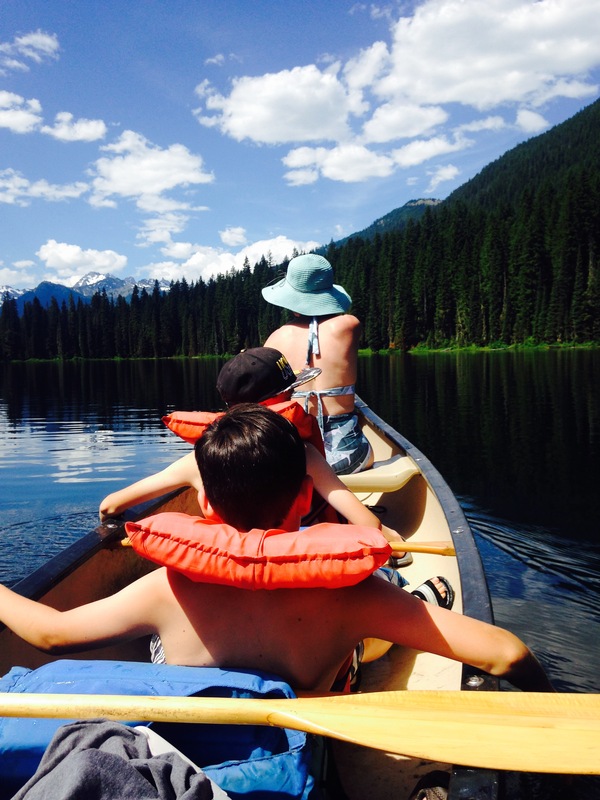 They spend their free time outside playing, inventing, and having a childhood more like those of the past with limited screen time and unlimited opportunity. We don’t have a TV though we do watch the occasional movie. The boys get one hour of screen time per day and the rest of the time they are finding their own things to do. They know how to use most power tools, taught by my husband as well as taking apart electronics and making them into inventions with working motors and steering. They know how to start a fire, a Swedish log, and basic construction skills enough to build a lemonade stand and cat tree playground. They run into and solve problems all day long. What if I hadn’t listened about the job at Discovery Lab in Thorp? What if I hadn’t known I was right about moving the kids despite the lengthy expensive court battle with their dad? What if I hadn’t paid attention to knowing it was time to leave the Discovery Lab despite having no plan for employment? What if I hadn’t applied to Thorp school for the art teacher position I didn’t think I had much chance of getting? All these moments took bravery. It’s hard to put yourself out there. It feels easier to stay put, to do what you know, but is it better? My psychic teacher once said, “The universe taps you on the shoulder, the universe slaps you across the face, don’t wait for the universe to run you over with a bus.” Oh wise Mel, you have taught me so much. Still timing matters and listening matters. It’s like keeping the phone line open in case that important call comes in, before we had call waiting. About a year ago, I happened to notice this house along Westside Road that we travel at least twice a day. I noticed that the snow had not been plowed to the driveway which meant nobody had been there. I watched it all winter, no tracks. The snow melted, I watched for signs of life. I told the boys about it, they termed it Mystery House. The house had this magical patina. It sat back from the road with a pond and tall evergreens separating and adding privacy. We watched it through the seasons, wildflowers in the meadow in the springs, dry grass by summer and deer grazing by fall. Neil looked it up on the county assessor sight. It was 18 acres, irrigated and rated as an accessory building not a house. We loved to fantasize about it, what if we lived there? We could ice skate on the pond in winter. We could build a fort on the island. We could have green grass pastures for Endy and Inez. We could have a garden, maybe a hoop house for spring and fall growing. We could hike to the top of the property and have a place to do yoga and meditate. The boys could build a down hill mountain bike trail. Maybe we could even foster an orphan or two from the Yakima range if needed. I could ride to the Iron Horse Trail easily. Neil could have a place to weld and work on his Porsche and all of the other things he currently has to fix out in the elements or in our carport. Neil and I talked about me writing a letter. I wasn’t ready to write it until I felt like I had his buy in so I waited until he gave me the address for the owner that he had researched. Still I waited. Finally on solstice, I felt the magical timing was right. I practiced writing it then rewrote it smaller so it would fit on four pages. I felt like our story was an important part to share, an introduction. Into the mail on December 21st it went. On the 23rd I got a voicemail from Kay, who had received my very long letter about her “magical property”. After the holiday, I called Kay to talk about the mystery house. She was giggling as we chatted about the “ironic timing” of my letter. The morning she received my letter, she and her 85 year old husband were discussing putting it on the market in the spring time. Our conversation felt like old friends telling stories and I realized that perhaps what drew me in, what attracted my whole family to the magical mystery house was the joy and adventure that she and her family had there. To be fair, the mystery house is not really a house. It has a kitchen and a bathroom and a warming room and garage doors on either end big enough to drive a semi-truck through. You know what else? The upstairs, the biggest mystery of all? That’s where Kay has her roller rink. Nope, I’m not kidding. Thank you for reading, let me know if you need a Fortune Telling Miracle Fish! I went to see the medium Thomas John. I half expected none of my dead relatives to show since most of my living relatives don’t have anything to say to me…. For a while now I have wanted to do a Frida Kahlo inspired portrait. She had her birds and monkeys and I have my horses. There is something about the way she looks in her self portraits that I can relate to. The are so solemn yet there is a magical sparkle to her eye. Being immersed in teaching art and art history this year has pressed me to improve my skills and experiment with new projects. A new year at a new school means new students. New students give me an opportunity to tune into a bottomless well of joy, excitement and sometimes pain and sorrow. Being an empath and an intuitive person seems to shine a bright beacon of light pouring like a searchlight for those who are lost. I often have adults seek me out to tell me secrets, dreams and wishes after only knowing them a few minutes. After a class, in a parking lot, out for a drink with my husband, in a horse stall or wherever I happen to be with my “VACANCY” sign lit in red, they find me. With children, their emotions are so raw, I can see a slump of shoulders, a glassy eye or a tight jaw and know that someone has something on their mind outside of not liking how their drawing is going. I can’t ignore these signs so I settle in next to them. Sometimes it’s a little thing, frustration with a sibling or someone on the playground. Sometimes it’s a big thing that almost knocks me down with its weight. Some of the things that kids have to see, go through, and worry about weigh more than their adult bodies ever will. Their shoulders are far too narrow to carry such sorrow so I tend to take a turn at carrying part of the load. By Thursday last week, I could barely stand under the weight of it. Three sets of heartbreaking news told by children was dense with sorrow. I wondered what could help me and realized when the house was quiet that some yoga could be of use. As my body led me through a sequence of its desire, my heart opened and let go of anything that wasn’t mine as a tear ran down my cheek. On my way to pick up my kids from their dads, I sang loudly to Mountain Sound and Rivers and Roads and by the time I got there, I was good. Over the weekend, I went to see a medium named Thomas John. My friend Cindy had loaned me his book, Never Argue with a Dead Person. When he was coming to Seattle, she invited me to join her for a small group reading. I felt anxious that maybe none of my dead people would show up. Most of my living relatives don’t want to talk to me so I wondered if it was the same with those that had passed. I really had one person in mind that I wanted to hear from, my grandmother Irene. I always felt that she truly understood me and loved me not despite who I was but because of it. I could tell her anything and she never judged. She let me make mistakes, of which I made many, but stayed by my side even when nobody else could comprehend my choices. I miss her earthly presence but I often feel her near me and know she’s been along on my best adventures rooting for me. During the group meeting I watched others go through a host of emotions. Some laughed at the familiarity of their loved ones humor as a deceased mother joked, “Everything was great until your father showed up, then things got LOUD.” I waited with my usual low expectations. Then it happened, a horse from my past showed up and then my grandmother. The medium connected and asked, “Did you storm out of a job?” I replied, “Many times.” “There was a big job change, yes? What I am hearing is clapping. Had you stayed at the other place, you would have gotten very sick and died. Do you know this?” When I took the job at Discovery Lab almost two years ago, I was letting go of Gildenfire which is something I loved and built and nurtured for so many years. When I was making the decision, I had been suffering from mysterious and crushing fatigue, weight loss, hair loss, paleness, and episodes of feeling fearful of simple tasks like walking down a snowy hill. Just to know that I was guided in that decision and listened and saved myself was a huge validation of my knowing. He reiterated several times, that I was very intuitive, and open to guidance and have been guided to the place I now reside. Seeing this medium helped me to see the answers that I already knew but could scarcely believe. I know that I am in the right place doing what I am supposed to be doing. I know that the family I have, the boys and Neil, is by no coincidence. I know that Endeavor found me and helped me find my way home. Once I was home, as I am now in Cle Elum, I found Inez and became part of her story. Her story is so sad and dire. She came to the orphanage with just one other foal, the rest of her herd bound for the slaughter. She came at just the right moment to remind me of the importance of patience, unconditional love, hard work, perseverance and never letting anyone tame you to the point you no longer recognize yourself. Hers is a story of total loss then rebuilding and learning to love and trust again. In the swift turn of the season from harsh everlasting winter to dry hot summer so to has my life changed. Just weeks ago my weekday mornings were spent at the Discovery Lab working with students on writing, math, weaving and science. 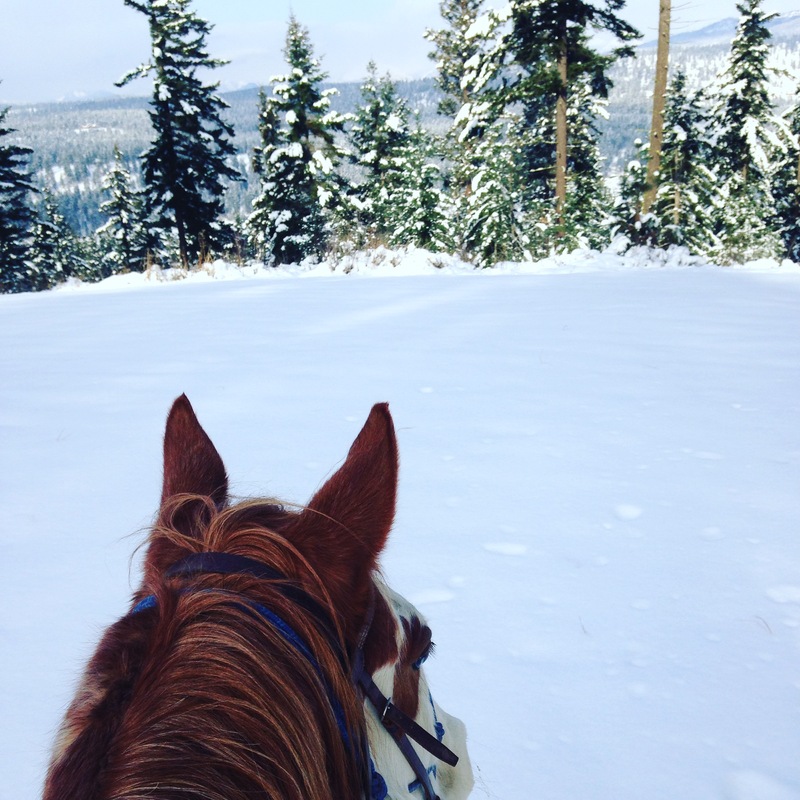 My afternoons were often spent at the barn with my gelding Endy riding through the woods above the Teanaway River. We rode through the winter in rain, deep snow and finally spring mud and wildflowers. I visited with parents at the classroom each day, chatting about children’s progress and catching up on everyone’s busy spring lives. I visited with the barn girls, a group of amazing, kind, interesting women who adore their horse time as much as I do. I prepared for the end of the year and the goodbyes that were ahead. I had decided months ago that I would retire from Discovery Lab when we lost our space at Thorp in the brick building at the end of the school year. In a flash, the last few weeks of school and the goodbyes came and went. 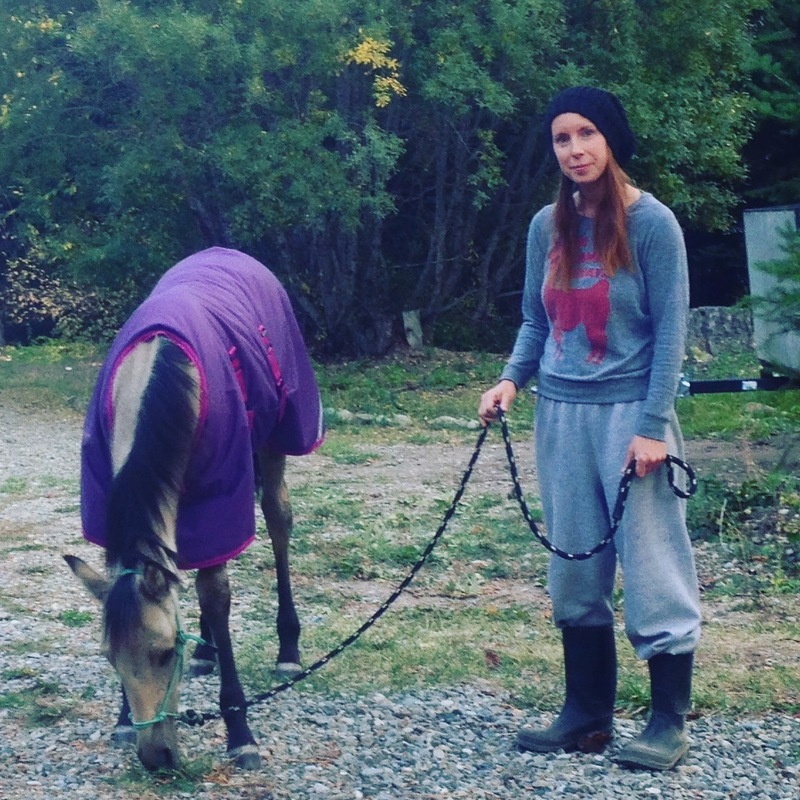 My horse Endy got sick with strangles and our glorious rides through the woods were replaced with visits in a stall wearing a Tyvek suit and rubber gloves and bleaching myself as I left. He is finally starting to feel better, which I can tell because he is furious about his situation. He went from days of leisure in a herd in a pasture to solitary confinement. There he will sit for another four weeks due to the contagiousness of his condition. My identity has shifted in so many ways. I applied for and was offered a job as the K-12 Art Teacher for Thorp Elementary and IGNITE (gifted) Program teacher. It was a total long shot, I didn’t really think I would get the job but I knew I wouldn’t forgive myself if I didn’t apply. So, this summer I dust off a few old hats and plan for a few new. 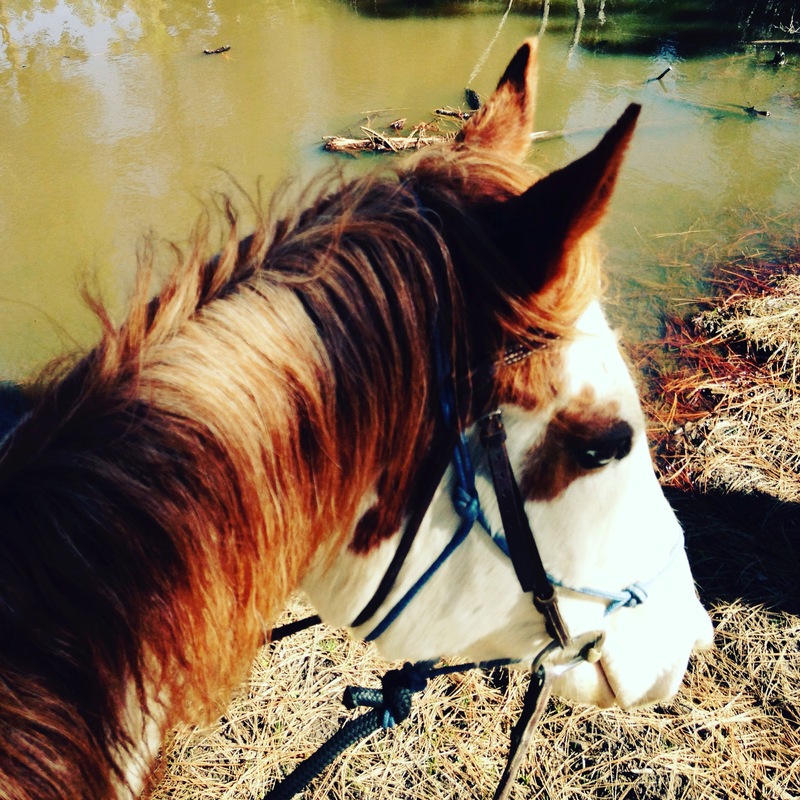 I am living as a novice horse trainer, working with Inez and Pippin an hour a day on sacking out, leading, round pen basics, bathing, ground manners, and preparations for riding, though for Inez that is a few years off. I finally got a garden in with strawberries, raspberries, pumpkins, sunflowers and herbs. I have been studying for my Teacher Preparation Exams because I am now working towards my teaching certificate and hope to apply to Central this fall. I am meeting with a mentor who teaches a similar art program in Seattle as I work to design the new art curriculum, taking classes and trying to make art everyday. With all that change, one thing stays the same and that is family. My boys and Neil are the center of my universe and the choices I make affect all of us. Without their love and encouragement and blind faith in my intuition, I would not be leading the amazing life that I lead. Then, there’s Inez. She has been here almost a year and changed me profoundly. As I watch her grow and change and work with her, she makes me feel like with enough persistence, I can do anything. What a blessing it has been to watch her evolve into this happy, funny, affectionate, and smart yearling. I can vividly remember almost a year ago when she barrelled into a fence as we tried to load her into the trailer at the orphanage in a total panic. Within a day, I had touched her. Within a week I had haltered her. She is still a wild girl at heart. Sometimes she seems to “pretend” to be scared of some non-existent threat to tear around bucking and racing and jumping anything she can. She loves her girl Pippin and spends their visits badgering her into mutual grooming and moments of play. Those two keep me steady. Everyday, I am out there, it doesn’t matter the weather, I made a commitment. Pippin has changed too. After a winter of viewing me with skepticism, I started working with her this spring. She hasn’t been ridden in almost a year so we started back at the beginning. Her aloofness faded with each lesson and she now follows me around leaning in for a selfie at every opportunity. Her sweet owners said she can stay a while longer and I am grateful. Endy will come home as soon as he is cleared of strangles and is well. I can’t wait to see him every morning when I wake up and say goodnight in the dark each evening. My wise friend and leader of Discovery Lab often reminds me that “Everything is unfolding as it should.” I will never be one to settle. I want to spend my life growing, changing and swallowing up every possibility that I can imagine. It’s been one year to the day since I stuffed my life into a snow globe and shook it like a wide eyed child. Every single thing in my life has changed, my location, my job, my existence, my everyday. When I told my husband about my “dream job” to replace my dream job that was slowly destroying my health and tearing my body apart, he said he trusted my intuition and his intuition agreed. This wild idea, this shift; would mean leaving our home, my community of dancers and their families, my circus community and the kid’s school community, for adventure, opportunity and big dreams of a different life. Everything about my days has changed. They center around my children, my school, my horses and spending every single moment outside that I can eke out of my busy existence. For six months, it meant a daily commute across the mountains to teach and run Gildenfire Dance and Acro and Viha Aerial Yoga, teaching and growing the Discovery Lab with bright creative students and families and fighting a splintering court battle to try and relocate my children for a better life. Was it worth it? Everyday when I watch my children thrive and my heart sits quietly watching as I get to use my creativity to teach children, to teach yoga to my lovely community at Dragonwood and to be a student everyday as I work with my horses, I know we made the right decision. That intuition connected me to the idea of Inez. I felt led to see the orphanage that had appeared in my facebook feed magically. I felt called to go there and volunteer. My heart told me there would be a baby horse that called to me and that needed to be a part of our family. So I’ve tried to use that same intuition in decisions about Inez. It’s not a perfect sense however and there are mistakes to be made and learned from. This training a foal is not a linear conquest. There are steps forward and steps backwards and steps sideways. We have days of success and days I feel like I’m flying a horse kite instead of taking her on a walk. I try to focus on confidence, trust and positive moments. Shannon, my friend and trainer and I loaded her into a trailer with Pippin and hauled her up to Dragonwood. She had a third trailer ride, first time in a stall and first time in the arena all in one day. We worked with water crossings this fall as often as we could. We played in flat puddles, deep ponds and even an indoor man-made puddle. She spent time with sweet young girls. She’s curious about them and needs these experiences to learn to mind her manners. New sounds and strange objects appeared in the yard as my husband played the part of electrician, plumber and heavy equipment operator to get a frost free tap and GFI outlet installed to bring power to the paddocks for trough heaters. This little wild horse permeates my thoughts, how to give her the best life, how to help her learn to trust, how to teach her to be my partner. 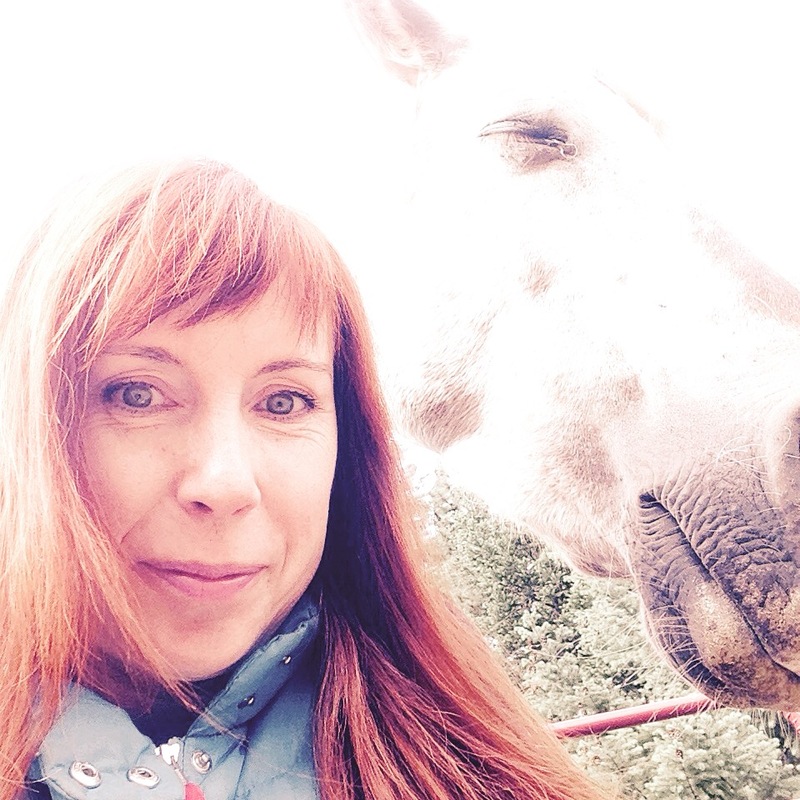 I read, I talk to everyone with wild and domestic horses about their challenges and successes, and I ponder. If something goes wrong, I head back a couple steps and see if we can find a way to make it work. She is a work in progress, just like my kitchen, just like my mini-farm, just like my life. Some days it’s just a mess but those days teach you. As for my snow-globe, all the glitter is still afloat, magical and not entirely settled. There have been so many firsts recently in my love story of raising Inez. Since her arrival, the only leader and mother she has had has been me. She has had the pleasure of being part of my herd alongside her human siblings. Watching my children grow as animal lovers and seeing them become confident around this once wild horse has been one of the greatest gifts. She has such a different and relaxed way with them, they are small, and so is she. They never ask her to do anything outside of her comfort zone and instead shower her with love and attention. I have to be the mom, I have to encourage her to keep moving forward, to trust and to be brave. Sometimes I am envious of their relationship and it’s carefree nature. She has been my shadow and when she is afraid of her own shadow, it’s me there to encourage her and let her know she can do it. 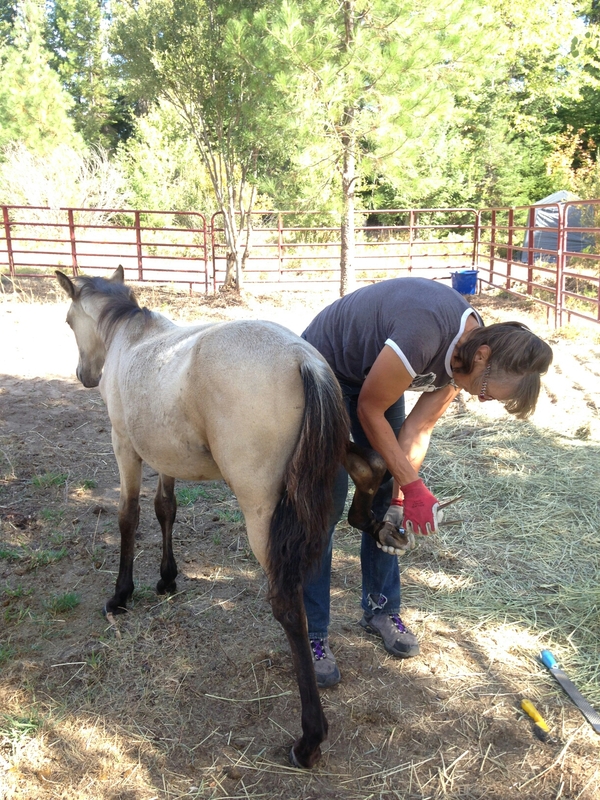 She had a farrier visit from our amazing barefoot trimmer Ute of Balanced Step. Her gentle energy won Inez over right away. She was able to trim her at liberty. Then we were on to planning for the winter which seems to be sneaking up far too quickly. Blanket practice went from a simple touch to wearing it during the night within a few patient weeks. We started with a touch, then eventually a rub, then a rub all over until we went through various stages of cover before finally velcroing it on. Around the homestead we are ramping up tasks to finish before the storms come. We are 90% complete on Casa Inez, designed and built by my amazing husband. 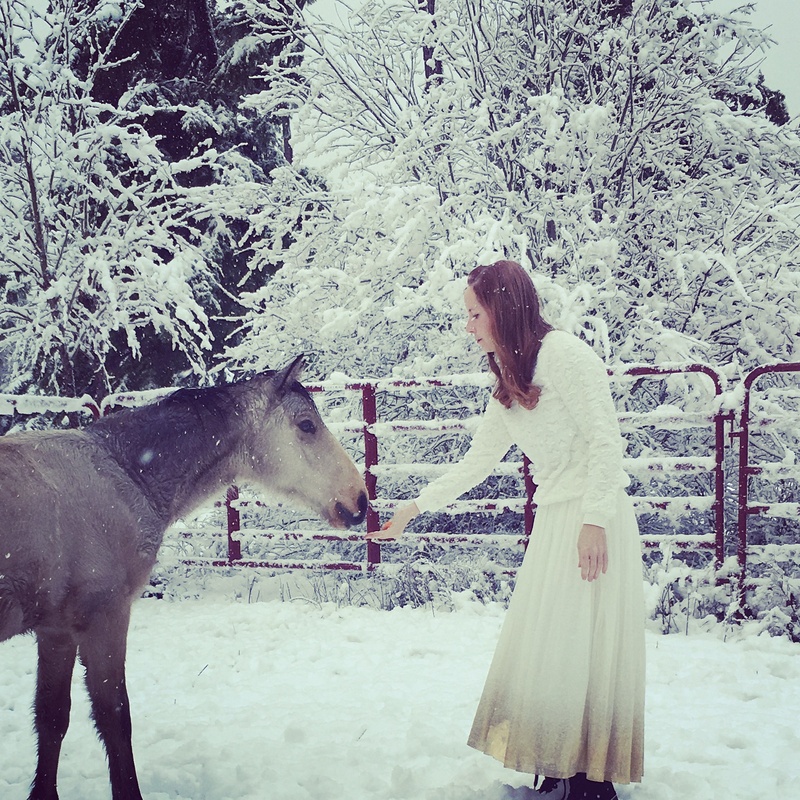 But, by far the biggest first is her first horse friend after being pulled off the range and becoming an orphan. 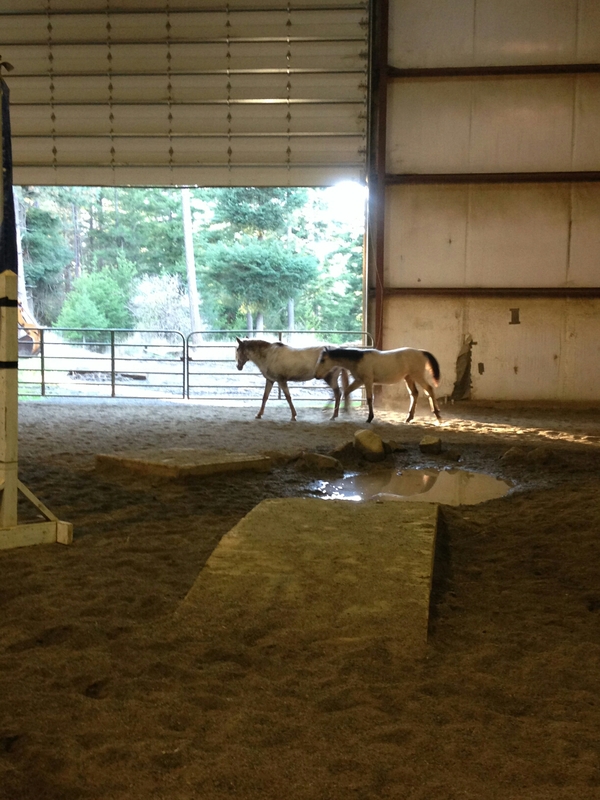 My sweet friend Hanni has loaned us Pippin the pony to teach Inez some horse manners and keep her company. For Inez it was love at first sight. Pippin is very tolerant of her intense admiration. I am now the third wheel. It’s hard to let go of being the center of Inez’ universe, of having her go anywhere with me, of knickers everytime I opened the door. But, in my heart I know it’s right. I am only able to give her two hours a day on weekdays and she deserves the joy of herd life and companionship. 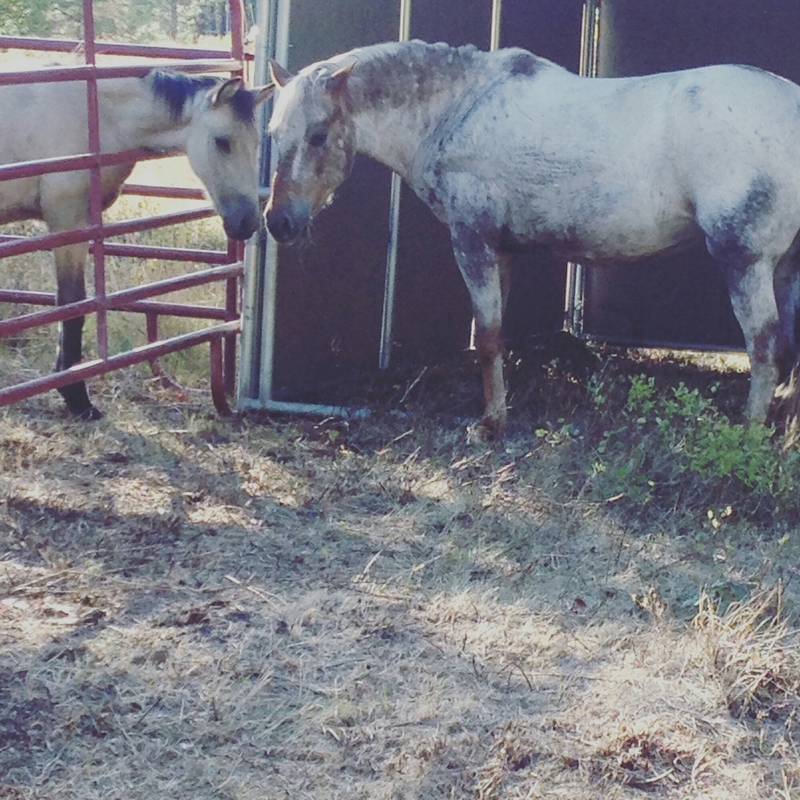 On the bright side, thats twice as many sweet horses in my yard to love and teach me and my family. I have just experienced the most magical summer since my childhood. It was the first summer I haven’t spent working since I was fourteen years old. We made a permanent move to Cle Elum, I retired from a fulfilling seventeen year dance teaching career, and of course, I adopted Inez. Whenever someone would ask, “How is your summer?” I would only reply, “I have a baby wild horse in my yard.” Enough said. Being able to look out my window and see her, walk out and groom or scratch her favorite spots, work with her throughout the day and sleep next to her paddock at night has helped to create a magical bond between us. I have learned more about horse behavior and habits in this last seven weeks than in the rest of my life. People probably find it odd that I have slept in a hammock beside her all this time. Waking up to find her curled up next to the fence at my feet and being greeted with her low throaty knicker is enough reward to keep me there. Winter is coming and I am still pondering whether I can find a way to sleep out there in the rain, wind and snow. Thank goodness for a supportive husband. When I closed my dance studio this spring, the generous families sent me off with a dream fund. Money to make my next dream a reality. That money paid for Inez’ paddock, adoption fee and basic first supplies. What a gift! This summer several of the families convened at my homestead for a reunion camp out. Several students and I met at Dragonwood Equine Facility where I board my gelding Endeavor for a trail ride. 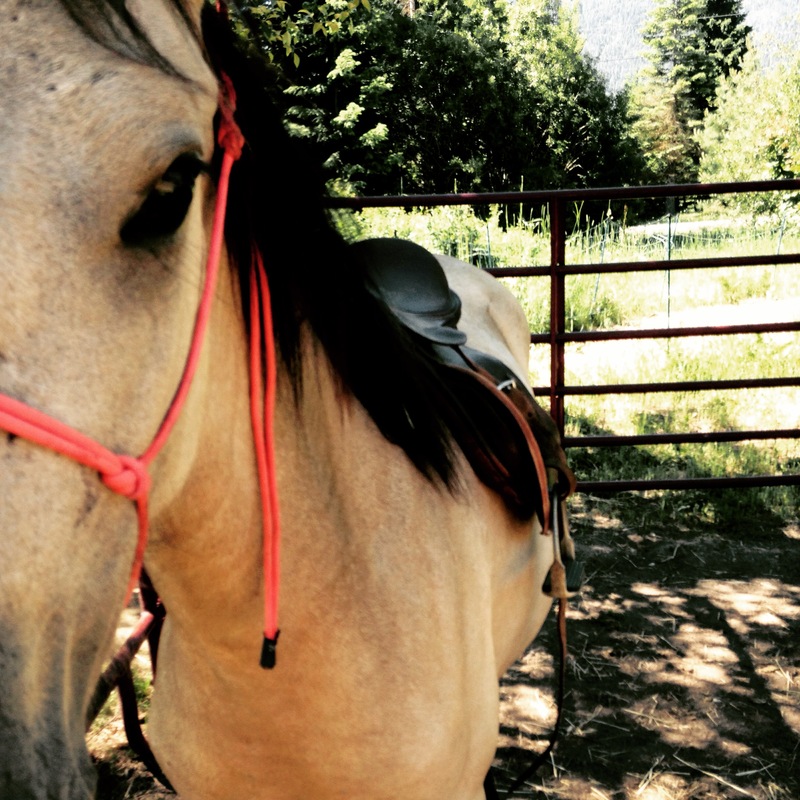 Some of the students had never ridden a horse and the others had varying levels of experience. Everyone had a great time. After the ride, everyone headed to my place to set up tents and to meet Inez. 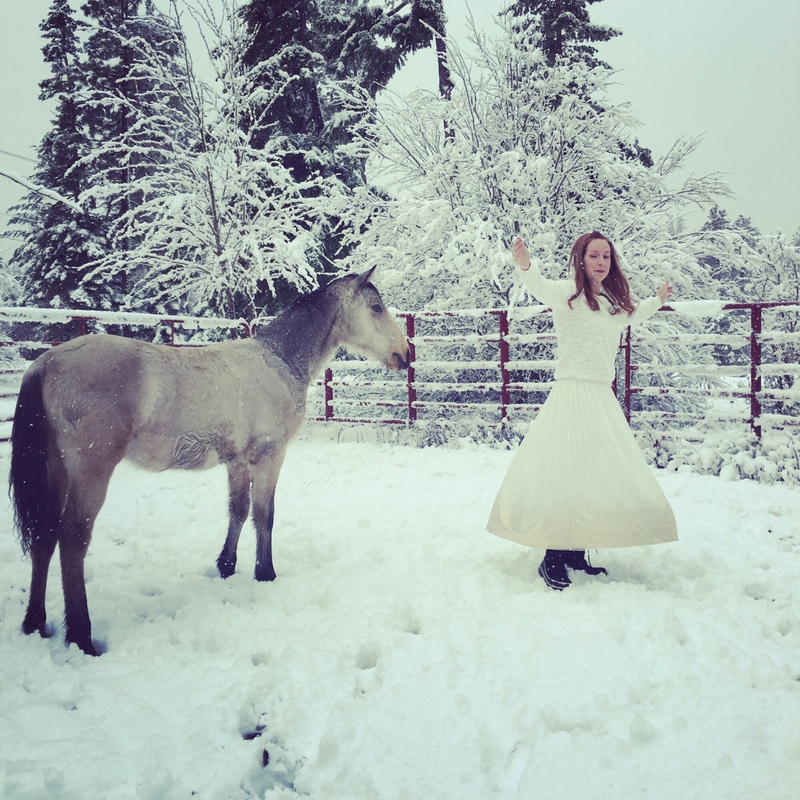 I think of Inez as an embassador of the wild Yakima horses. 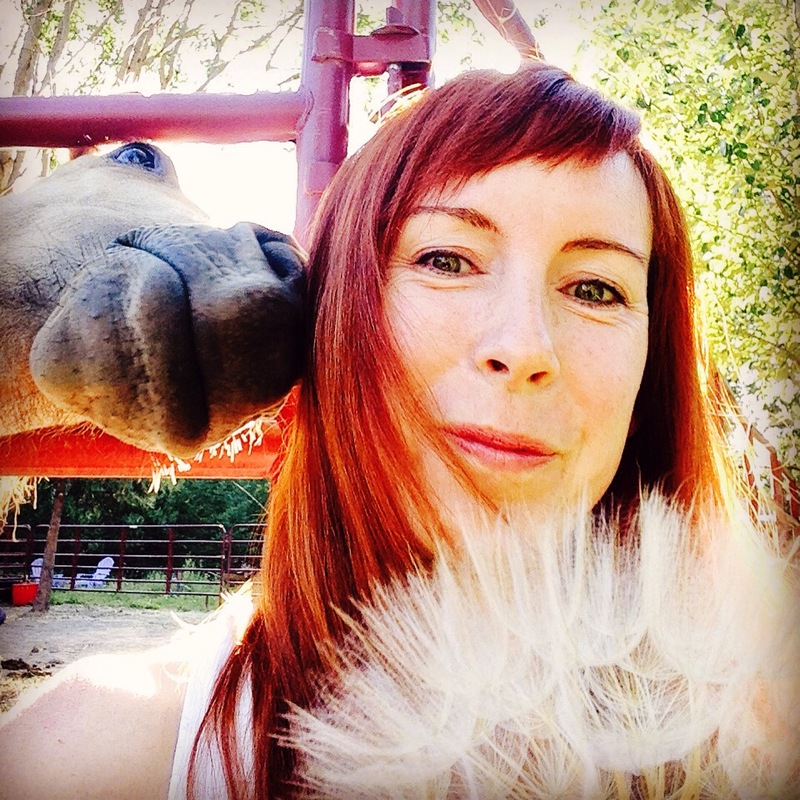 Her job is to inspire, educate and share the story of the orphan foals. As my guests ask questions about how she became an orphan, where her parents are and how I came to adopt her, I share the heartbreaking story. Why? Because these children, they have the opportunity, the drive, the fire and passion to change the world. So on a day we are expecting the first rain since her arrival, I feel the summer drawing to an end. In one week, I will go back to work as a teacher at the Discovery Lab. My time with Inez will bookend my school day. It makes me dream of finding a way to combine my passion for teaching children and my passion for horses. Maybe someday. Just shy of my one month anniversary of adopting Inez, I felt like she was ready for a little exploration outside her paddock. Over the past weeks we have worked on haltering and leading. While leading, I have worked by moving her head, then hips to create an eventual forward cross over step. Each time she locks up in forward motion, I work through it by moving her into a hips over. We have also worked on our head down cue extensively so that she can learn to give to the pressure at the pole and feel the release when she gives. I had my husband Neil on hand to help me open one of the panels so she could exit into the semi-grassy meadow. He opened the panel and she stared wide eyed at the opening. A few gentle nudges forward and she had her head in the grass grazing with eyes closed, bliss. She turned into a bit of a mule getting back in but with gentle nudges forward and moving her hips we were safely back inside her paddock. I released her and went to get her grain. As soon as I exited, she began to run and kick an whinny. She did hotlaps for several moments before settling into eating her grain. Having Inez out in my yard is such a blessing. Not only is it a joy to see my family interacting with her throughout the day but it gives me opportunities for short training sessions several times each day. In between the sessions, I spend time cleaning her paddock, giving her gentle massage, lots of scritches and sometimes sitting with her reading while she dozes in the warm sun. Working with the halter was my first priority. In order to keep her safe during vet visits, being able to load her into the trailer in an emergency and being able to keep her still for grooming and care, she needed to get used to a halter. Shannon brought over one of her rope halters. If you are not familiar, these are designed for Natural Horsemanship and have no snaps, buckles or stitching which makes them safer and stronger. Thier unique design assists with training and helps put pressure in the right places which helps the horse to understand and respond to cues. 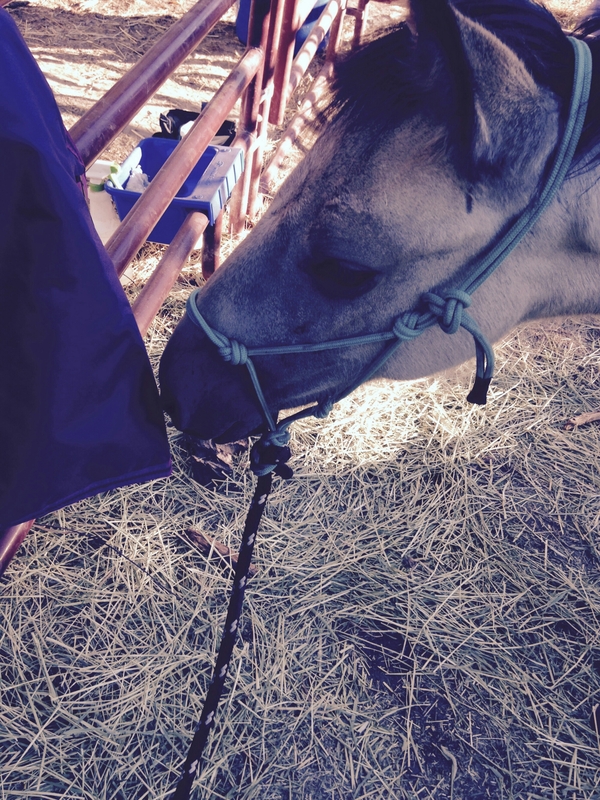 First, I spent time rubbing the halter all over Inez until she didn’t care about it. Next, I put the lead rope over her neck and used it to gently pull her toward me, giving to the pressure. Before long, this was quite routine as well. Next, I calmly slipped the nose band over her muzzle. That was a whole day of short lessons of calmly putting on and taking off just the nose portion. I am still sleeping outside with her for those of you who may be wondering. She eats most of the night but now feels comfortable to doze next to me sometimes as well. She had a lovely visit with my niece this week. It’s fun to share this love with Kate. I think she could have stood in the paddock petting her all day. Up next will be learning to lead. I keep telling Inez that once she can lead, I will take her to eat grass but she’s just not sure. Baby Inez was said to be about four months old by the catchers. She arrived and we watched for water drinking and pooping before giving her some of the beautiful hay I had bought from a local hay farmer recommended to me. Gnats, flies and bees were landing on and annoying her. Shannon suggested I wrap some rags soaked in lemon balm and eucalyptus oil on the tree she was rubbing on. Besides her head wound from loading she had little scratches, some raw spots where she had been scratching and eye mucous. We noticed her belly was distended and assumed worms and that she had a small umbilical hernia, which is fairly common. I knew she would be worried without her herd. Less than five days ago she had been a wild horse with a mother and a herd and a range. I hung out my hammock next to her paddock and set up my bed. As far as her emotional state, she was tenative but curious and within two days, I had a touch to her neck under my belt. I was moving slow and low and keeping my energy very soft. On day four, Shannon came over to show me some basic touch and turn ideas to use. 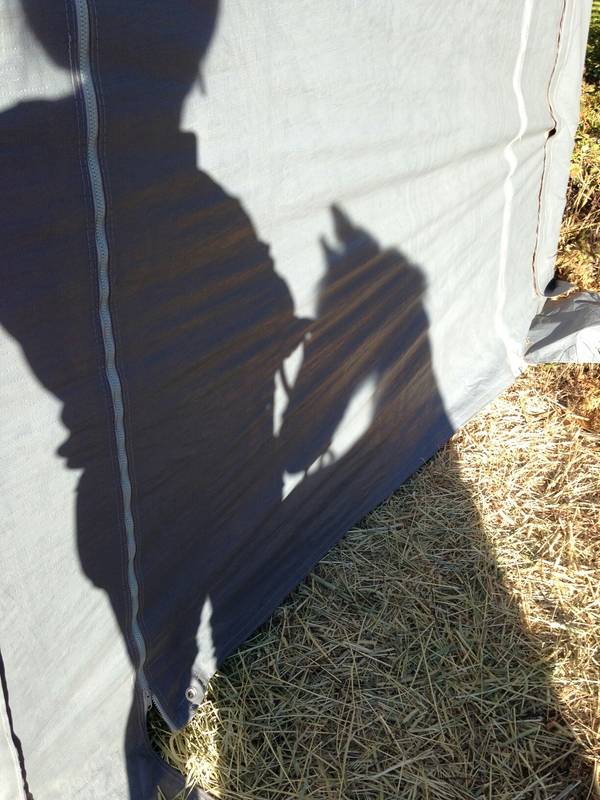 Sending her forward, inviting her in, all things I had been learning at Horse to Human the past three years. I was able to get a few side touches and she was slower to leave. On day five, she was following me around as I cleaned her pen. She finally accepted some withers and fanny scritches and even my husband Neil and the boys were able to touch and pet her. On day seven I was greeted with some nickers when I approached and she finally ate her grain. Mixed in with her grain was a probiotic, a little apple cider vinegar, herbs like slippery elm, chamomile and peppermint. At night, I noticed she was much calmer and busily eating her hay. During the day, we worked on short training sessions with plenty of scritches and time for naps out in the sun. I have been working hard to develop and listen to my intuition. It’s been a little over a year since I started working with a teacher and longtime friend Mel and it’s hard to express how everything in my life has changed. By letting myself be guided, opportunities in every area of my life have blossomed like a lotus flower. I have begun a new career, moved to the country after living in Seattle most of my life, I have strengthened my relationships and let go of those that caused more harm than good. My body,mind and spirit are all flourishing after years of neglect. This Summer, I have time off for the first time in about 25 years. 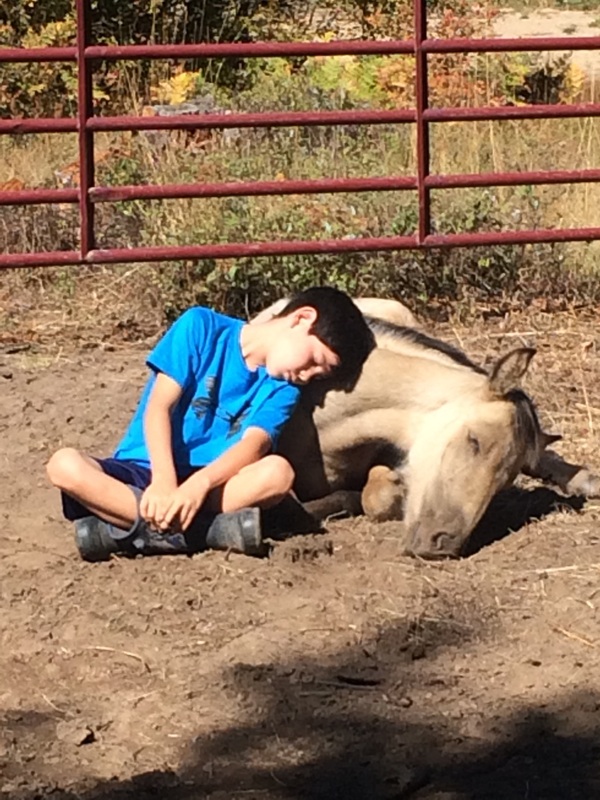 A few weeks back my attention was drawn to the Yakima Orphan Foal Rescue. 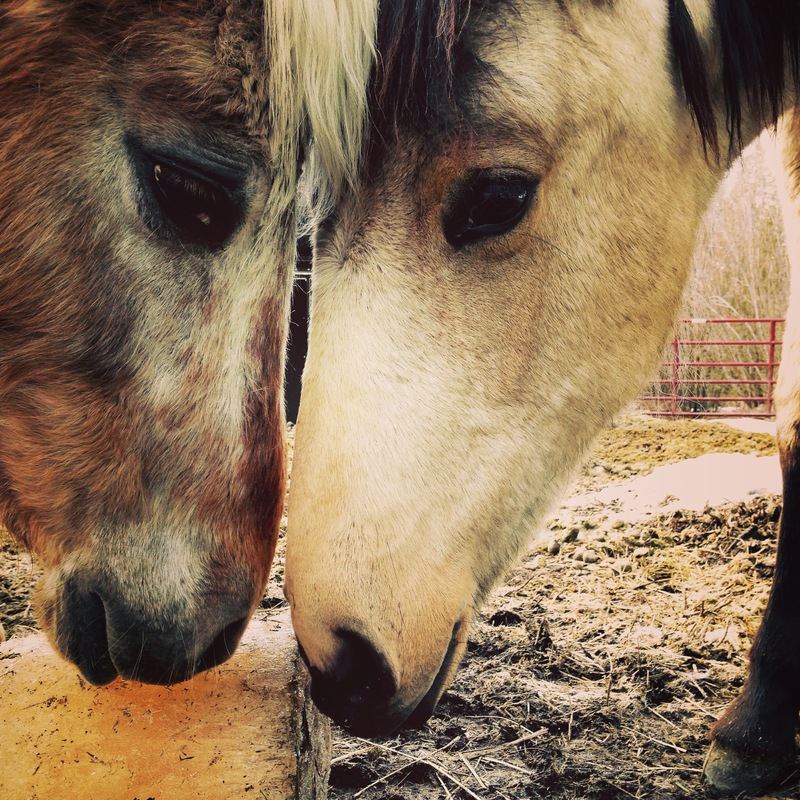 The plight of wild horses has been on my radar for a few years and I was drawn in. These orphan foals are caught on the range along with their mothers and adult members of their herd. The adults have been deemed to dangerous and have been sent to auction. Because of the relationship of Melody Williams LeBeau with the tribal catchers and in collaboration with Thunder Mountain Rescue and their devotion the babies are saved. I immediately felt a strong pull towards the rescue and decided to volunteer and see what it was all about. I spent a day looking at the foals, talking to Melody about her tireless and selfless efforts to save these babies and mucking out a few paddocks. I was back the next week as she had a few herds brought in and was pretty exhausted after looking after an orphan who had been left behind on the range and rescued after a week of surviving on its own. She let me help with milk duty and brought me a chair to watch the baby. The next week, one of the yearlings went to its home so my boys and I went to muck out his enclosure because I wanted them to see the babies and understand the dire situation. There are just so many awful, scary, out of control things going on in the world right now. They feel enormous and like I will have no effect in trying to help. Everyday, I think of all the ways to make my children loving, compassionate, aware future citizens and allies of our world. What if I could do something immediate, change just one life help bring awareness to one more difficult and unfair circumstance? I decided, alongside my husband, children and trainer/friend Shannon King of Horse to Human, that this was possible. When I asked Shannon what she thought of the idea, she said, “I think you are crazy, but I will help you.” I took that as a ringing endorsement and decided to send in my application so I could be ready in case a baby or pair of foals caught my eye. Within five minutes of submitting my application, the rescue posted two older babies pulled off the range. Because of their age, they would be allowed to be adopted separately. I immediately responded and began the process of being screened. By 11:30 that night, we had been accepted. I named our new baby Inez. That weekend was full of preparations. 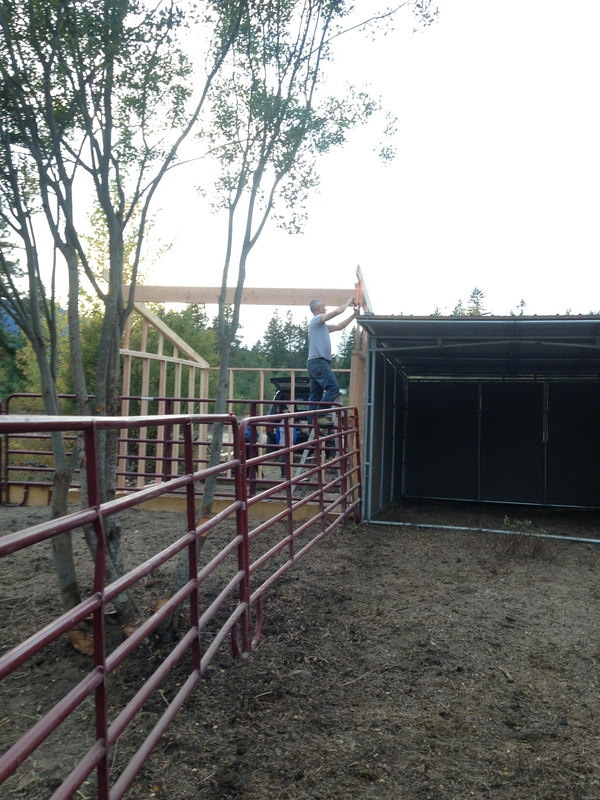 Pasture space was cleared, panels went up, hoses and hose filters, hay and water tubs all put in place. I researched and read as many stories from adopters as I could. 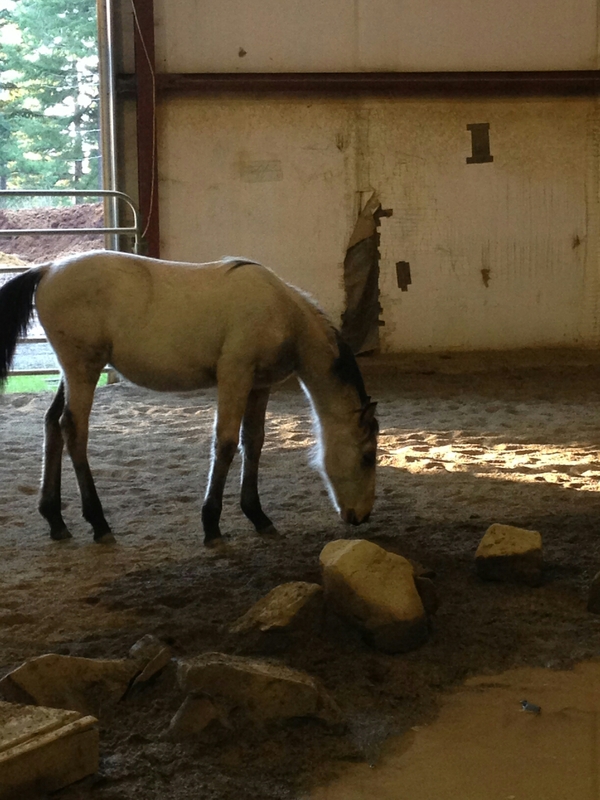 The rescue provides an open group on Facebook called Yakima Orphan Foal Network. You can join the group to see updates, volunteer and donate: https://www.facebook.com/groups/YakimaFoals/?fref=ts. There is also a closed group for adopters to use as a resource to ask questions of other adopters, share stories and get updates. When Tuesday finally came, I was so anxious about loading, unloading, the trailer ride, her health I thought I would never get through the morning. Finally it was time to go and my boys, Rohan age 11, Finn age 10 and our trainer Shannon King hopped into the truck and set off to Toppenish to meet our girl. It was close to 100 degrees in Toppenish so Melody and her son helped Shannon and I get Inez loaded and on our way as quickly as possible. Inez panicked and went headlong into a panel of the loading chute then scampered into the trailer. The ride back was long and hot and we were worried about our girl being under stress. I was thrilled when Shannon backed the trailer right up to our chute at home and Inez made her way down the path into her new home.